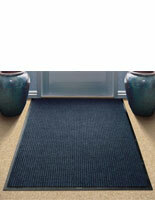 This navy blue floor mat is a classic rectangular style doormat that measures 3’ x 10’. 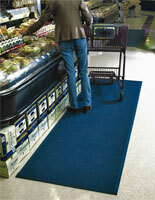 This type of carpeting is often found at malls, stores, restaurants and cafes. 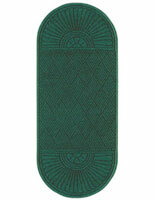 The floor mat is made of absorbent polypropylene so it dries quickly when wet. 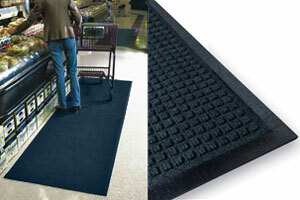 The bottom of the carpet has a non-slip rubber backing for extra safety. 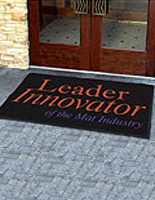 The floor mat is easy to keep clean to provide a fresh, clean entrance to your business. 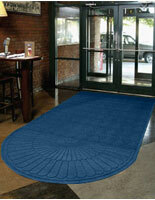 The navy blue color also looks great anywhere! This carpet is anti-static rated at 1.2KV by the AATCC and Certified Slip Resistant by the National Floor Safety Institute.